Abstract: Natural language processing presents a variety of unsolved tasks and engages people all over the world to apply statistics, machine learning, deep learning and linguistics in order to solve those tasks. Linguistically complex tasks are the most challenging because they require linguistic intuition. In this talk, we will discover how linguistic intuition can be formalized and encoded to solve the problem of complex word identification and correction. We will investigate word formation, dive into language structures and learn about language modelling. 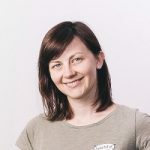 Bio: Mariana Romanyshyn is a computational linguist passionate about building natural language processing applications. She has professional experience with syntactic parsing, sentiment analysis, named entity recognition, fact extraction, text anonymization, etc. For the last four years, Mariana has been working on error correction and text improvement algorithms at Grammarly. She cares a lot about computational linguistics, constantly looks for talented linguists and spreads the word about the field of NLP by participating at AI conferences, collaborating with Ukrainian universities and organizing educational events. Mariana's main interest is structural linguistics as a method of formalizing the natural language. Technical Lead	at Grammarly Inc.